"Begin with Uncle Ben's® Rice and end up on a culinary trip to Thailand. Peanut sauce and spinach meet for an exotic plate of Thai salad with healthy whole grain brown rice and delicious basil seasoned chicken." 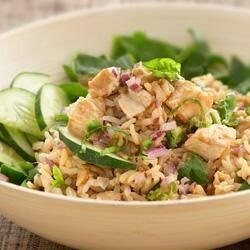 Combine the rice with cucumber, dressing, chicken, and onion. Cover and chill. Just before serving, toss the salad with the spinach and basil. Boyfriend really liked this, I really didn't, I thought the dressing was WAY too overpowering. This was delicious. I cooked the chicken ahead of time in the crock pot so it was shredded. It made a huge amount! As I made it, it wasn't as pretty as the picture and the smell of the rice vinegar had me a little worried. But then we tried it and it was AMAZING! Great recipe, highly recommended!